The July 2016 Wider Circle is now available! Catch all the latest news and happenings around St. George’s! Wishing you all a SAFE and HAPPY Independence Day! The June 2016 Wider Circle is now available! Catch all the latest news and happenings around St. George’s as well as important info about our upcoming formation classes and participation in the Capital Pride Parade. The May 2016 Wider Circle is now available! Catch all the latest news and happenings around St. George’s as well as important info about our upcoming Yard Sale and Parish Retreat. The April 2016 Wider Circle is now available! Catch all the latest news and happenings around St. George’s as well as important info about our upcoming Yard Sale and Parish Retreat. The March 2016 Wider Circle is now available! 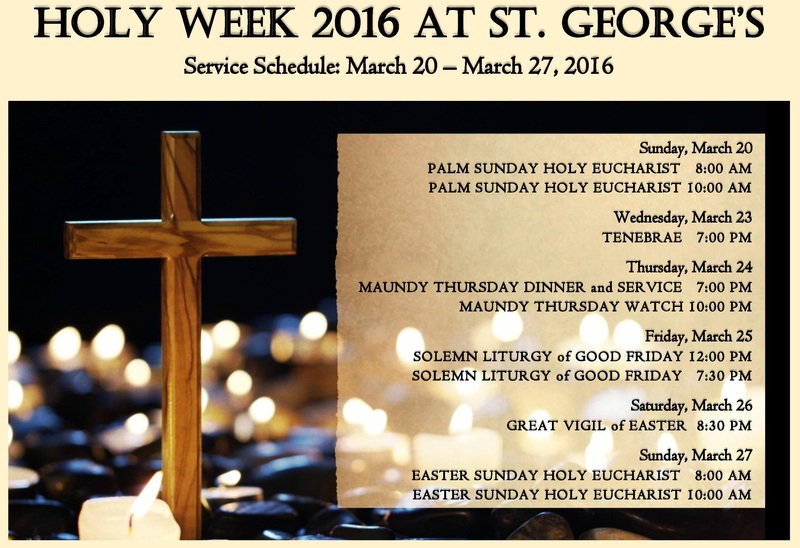 Catch all the latest news and happenings around St. George’s as well as important info about upcoming Holy Week and Easter. The February 2016 Wider Circle is out now! Are you prepared for Lent? Learn all about St. George’s services, outreach and activities in this month’s newsletter. January 2016 Wider Circle Our first newsletter of the year is here! Keep up with all the current events and fellowship opportunities at St. George’s Episcopal Church in Glenn Dale, MD at the beginning of 2016. Wishing you a Happy and Blessed New Year! #ICYM we’ve added an archive of all our newsletters from 2015. Our Wider Circle is available by email subscription as well. Just contact the Parish Administrator to be added to the list. See you in 2016!